An attempt to build a functioning radio reviever using copper plumbing pipe instead of wire. Inspired by the true stories of people who picked up shortwave radio from the RCI radio towers in their kitchen sinks. Interviewing locals at the Sackville Fall Fair about this phenomenon. Some people also picked up the radio on their clotheslines and in refridgerators. Map of the region with RCI towers and broadcast directions charted. Looking to coincide ideal sink placement with broadcast schedule. Inspired by a local phenomenon related to the RCI radio towers on the Tantramar marshes. Many Sackville residents report stories of strange household devices picking up and playing radio signals from the international radio towers; telephones, televisions, light fixtures, refrigerators, toasters, sinks, and bathtubs. Apparently, older houses with copper piping sometimes catch the radio waves in the sink, as the copper piping acts as an antenna and the sink itself acts as a loud speaker. In this project, I have attempted to recreate such a situation through building my own free-standing sink structure out of copper piping and metal plumbing components. I took my radio sink on location to various outdoor locations in view of the radio towers in an attempt to hear the radio from my sink. The public was invited to come out to see and hopefully hear the radio sink in the marshes. 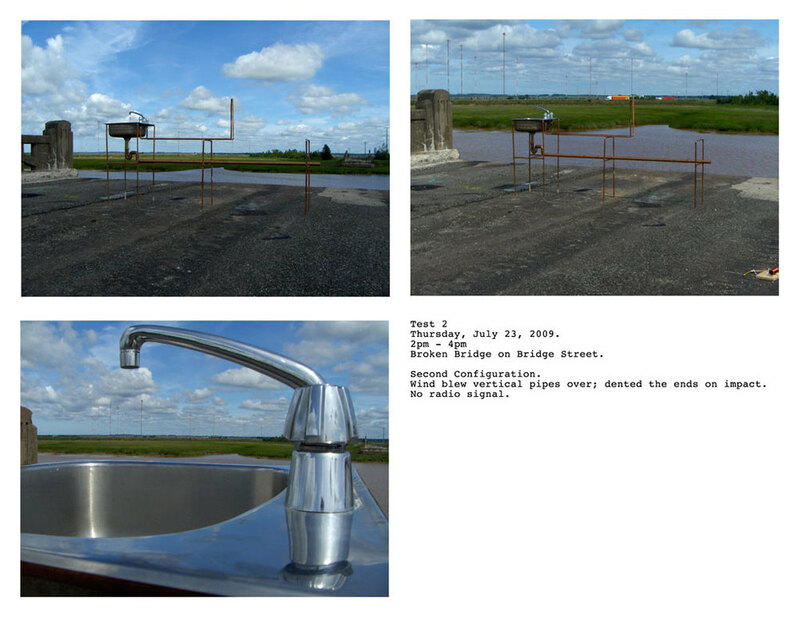 I photographed the sink in each location with the marshland landscape and the radio towers in the background.